End in sight for Radio 4 Long Wave | What Hi-Fi? The end is in sight for Radio 4 Long Wave (LW). The BBC has confirmed there will be no further funding for LW radio – and the service is relying on two irreplaceable valve transmitters just to continue broadcasting. 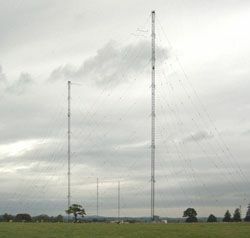 The BBC Radio 4 LW service broadcasts from Droitwich, Worcestershire (pictured), and uses two specially-made valves, of which it is claimed there are only around 10 in the world. When one of the ageing valves blows, the LW broadcasts will fall silent, claims the Guardian. Cost-cutting measures announced last week confirmed that Long Wave radio would receive no further funding, while MW transmissions will be scaled-back. Programmes on Radio 4 LW include Act of Worship, Daily Service, Test Match Special and Yesterday in Parliament. These programmes would otherwise interrupt other programmes that are broadcast on FM. The service's impressive reach and ability to house hours of programming without interruption – such as Test Match Special – have brought the station a small but loyal fanbase. The BBC plans to find new homes for the programmes when required, with the DAB, FM and internet platforms available. Denis Nowlan, the network manager for Radio 4, said: "This is technology that is becoming obsolete. Digital radio now reaches 97% of the population, and there is plenty time to find new homes for long wave-only programmes."